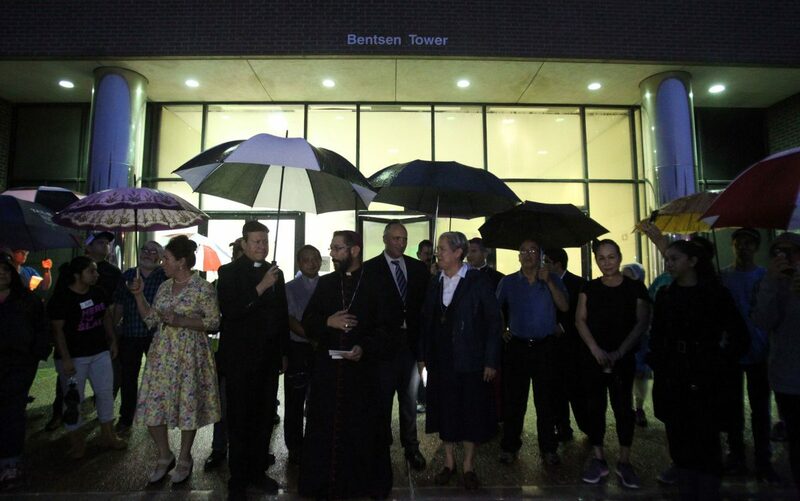 Bishop Daniel Flores of Brownsville gathers with Rabbi Claudio Kogen of Temple Emanuel and Sister Norma Pimental in front of the Bentsen Tower on Wednesday, June 20, 2018 at in McAllen. 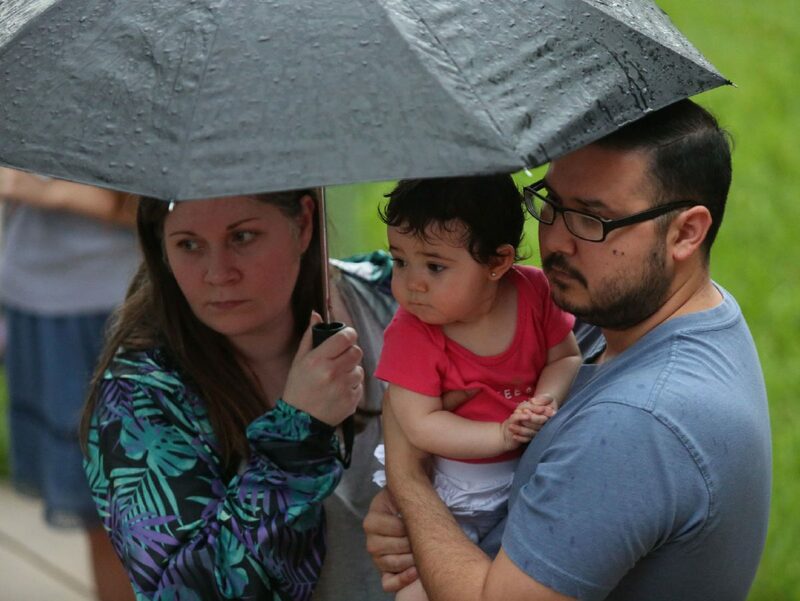 McALLEN — Not even the severe flooding that slammed an unexpecting Rio Grande Valley on Wednesday could keep people from attending a vigil in the name of the children who are being separated at the border. 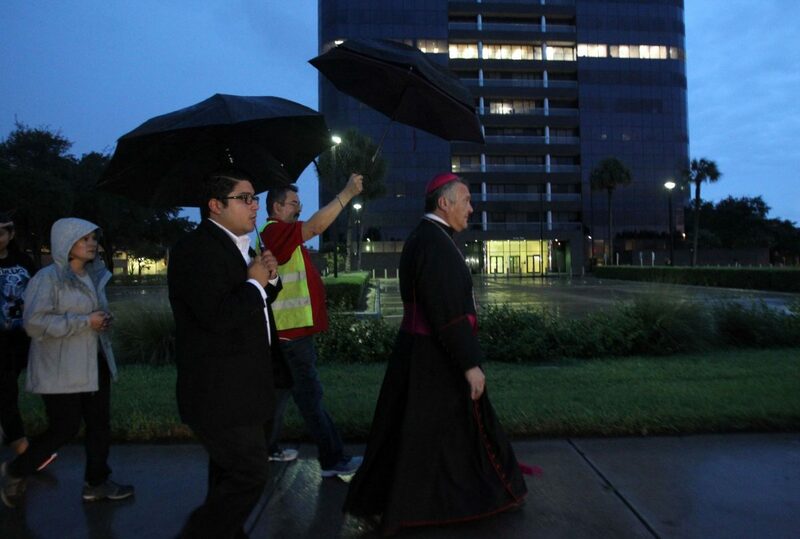 Interfaith leaders, local advocates and supporters of separated families joined a Catholic Charities-led vigil, prayer and walk at Archer Park in McAllen, braving a cold drizzle Wednesday night after already experiencing early-morning thunderstorms that left parts of the Valley inundated. Still, close to 200 people made their way a few blocks to the front of the federal courthouse, where the parents of the aforementioned children ultimately make their appearance for prosecution for entering the country illegally. 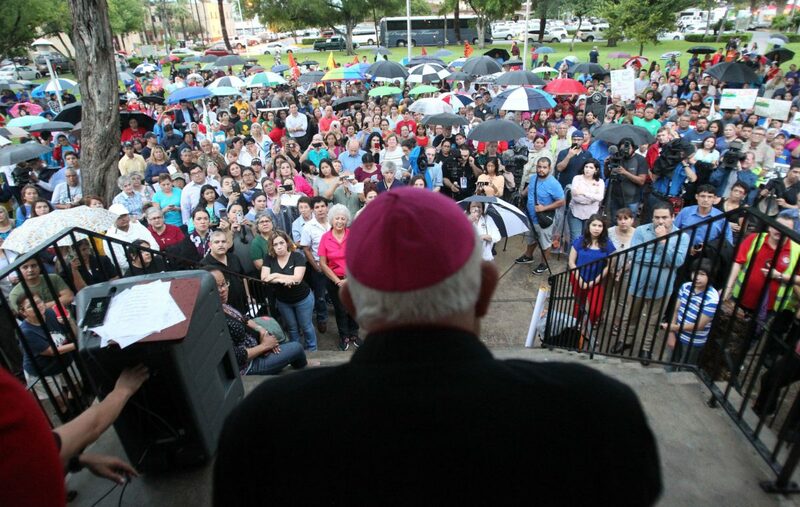 Bishop Emeritus Raymundo Peña speaks the crowd of over 300 who gathered for a vigil and prayer march at Archer Park on Wednesday, June 20, 2018 at in McAllen. Bishop Mario Avilés walks on the sidewalk in front of the federal courthouse during a prayer and vigil walk for immigrants on Wednesday, June 20, 2018 at in McAllen. Adriana and Eleazar Salinas hold their baby Eiza,9, months during a prayer and vigil for immigrants and family separations at Archer Park on Wednesday, June 20, 2018 at in McAllen. Juanita de Herrera, 70, also of San Juan said that as Christians people of faith should “act out of our hearts,” citing Jesus Christ. The vigil follows a roundtable discussion earlier in the week attended by members of Congress, local advocacy groups and interfaith leaders who were provided tours inside two Brownsville detention facilities for children. Then on Wednesday afternoon, on World Refugee Day, the president seemingly backed down on his administration’s policy of separating undocumented families along the U.S.-Mexico border as a deterrent for illegal immigration by signing an executive order halting such action. Such action comes after a national torrent of outrage from lawmakers on both sides of the aisle, as well as the American public, condemned the separation of children from their parents at the border. The signing also comes amid reports of refugees being denied relief along the ports of entry in Reynosa, Brownsville and in El Paso, according to immigrant advocacy groups helping asylum seekers at ports. The order now requires immigrant families be detained together after they’re caught entering the country illegally, and to be held together for the duration of the parents’ criminal proceedings. This is a potential violation of a court settlement reached years ago and may set up a potential fight in the courts. In addition, the order would prioritize parents with children to the “front of the line” for immigration proceedings but does not eliminate the administration’s goal to prosecute everyone who crosses into the country illegally, which is also known as the “zero-tolerance” policy U.S. Attorney General Jeff Sessions announced in early April. But critics say it does little to help the more than 2,000 kids already separated from their parents. These children are seemingly lost as they go through the separation process. Questions still remain as to how long and where the families will be detained. Bishop Daniel E. Flores of the Catholic Diocese of Brownsville addressed the executive action just as the drizzle began Wednesday evening. Flores said there are children in detention centers weeping for their parents, who sit in detention on misdemeanor charges desperate to know their children’s whereabouts. The bishop further described the separated immigrants as an impoverished people embarking on a perilous trek to escape violence and the threat of death in same cases. Requests for comment regarding Trump’s order sent to both U.S. Border Patrol and U.S. Customs and Border Protection officials went unreturned as of press time. U.S. Rep. Vicente Gonzalez, D-McAllen, asked for more answers. Sister Norma Pimentel, the executive director of Catholic Charities of the Rio Grande Valley and longtime advocate for immigrants and refugees, met with House Speaker Paul Ryan earlier this month in an effort to urge the passage of legislation for a replacement to the Deferred Action for Childhood Arrivals program, or DACA, which currently shields nearly a million recipients from deportation and has been in limbo since the Trump administration rescinded the program. Pimentel most recently made an appearance outside the Border Patrol processing center in McAllen to lend her support to advocates who say the separation of children from their families is a “cruel and immoral” practice. She came to prominence during the previous humanitarian crisis in 2014 by providing a shelter for scores of family units and unaccompanied minors from Central and South America who came to the U.S-Mexico border seeking safety from the violence in their home countries. Earlier Wednesday, more than $350,000 in federal funds was awarded to Catholic Charities of the Rio Grande Valley, the Food Bank of the Rio Grande Valley, and the city of McAllen, according to a news release from Sen. Juan “Chuy” Hinojosa’s office. The funds will reimburse the entities’ food, shelter, transportation and medical expenses racked up during the aforementioned “surge” of unaccompanied minors between 2014 and 2016. Another roundtable discussion is set for this Friday, when more than two dozen Democratic members of Congress, in addition to U.S. Sens. Ted Cruz and John Cornyn, will meet in Weslaco with local leaders from throughout the Valley, and with officials from several federal agencies, including CBP, Border Patrol, Immigration and Customs Enforcement, the Department of Homeland Security and the Office of Refugee Resettlement.